After collapse of the Xepian-Xe Nam Noy dam, the Chinese medical team rushes to the flood-hit area and carries prompt rescue efforts. On the evening of July 23, the Xepian-Xe Nam Noy dam under construction in Sanamxay district, southern Laos, collapsed. More than 5 billion cubic meters of water flooded into13 villages, affecting nearly 13,000 people’s life and inflicting heavy property loss. Following the dam-breaking disaster, the Chinese People's Liberation Army medical team, which is carrying out the “Peace Train-2018” humanitarian rescue drill in Vientiane, Laos, responded quickly and dispatched an epidemic-preventing squad consisting of 32 soldiers. Carrying equipment and materials, they rushed to the flooded area in batches that very night. As the only foreign military rescue team invited by Laos, they are the first medical staff to enter the disaster area. The PLA epidemic-prevention squad is made up of experienced staffs. Most members joined in relief operations during the serious earthquakes in Nepal and China’s Wenchuan. Many went to Africa to fight against the Ebola epidemic. "Thank you, and thank China! 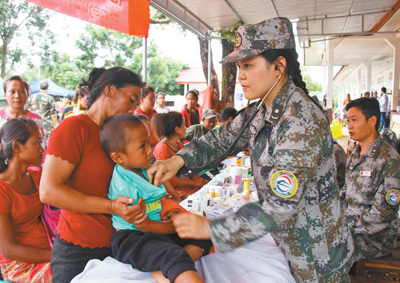 When Laos suffered a deadly disaster, China quickly gave us a hand," said Lao Deputy Prime Minister Sonexay Siphandone when visiting the PLA medical members at a local hospital on July 28. "A friend in need is a friend indeed. China is a true friend of Laos." Besides the Chinese PLA squad, the Blue Sky Rescue team and other civilian organizations from China also joined the rescue efforts in Laos. "We rescued 9 victims at night on July 26. And in the following days, we have searched 6 villages and found another 20 plus victims." Yin Shangwen, a member of the Blue Sky Rescue Team, said. On July 30, the humanitarian emergency relief of the Chinese government's assistance for the flooded southern Laos was handed over to the Lao side in Lao capital Vientiane. The aid, carried by a Boeing-747 cargo plane of China Eastern Airlines, includes 100 boats, 500 tents and 100 water clarifiers.